﻿ Air Dragon Review: Does This Portable Air Compressor Work? If you own a car, you know that getting flat tires is part of the process. The thing about a flat tire or getting a puncture is that it happens in the worst of moments. For example when on the roadside, rushing for a meeting or even a trip. It is, therefore, convenient to have a tool that can inflate your tires when this happens. An air dragon is a portable, hand-held air compressor that plugs into a 12V power that is suited for this purpose. It is a product of the Telebrands Company. It easily fits in the glove compartment or trunk and can be easily accessed for use. 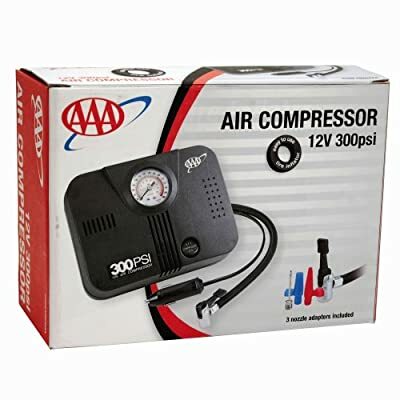 The air compressor can also be used to inflate other materials that need air such as basketballs and bike tires. The air dragon review will enable you to determine exactly how the compressor works, the unique features, and other similar products available. 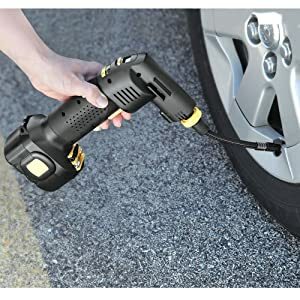 Compression: The handheld tire inflator has a compression where compressed air, also potential energy, is converted into power that inflates the tires. Plugin: As earlier stated, the tool plugs into a 12V outlet. The plugin facilitates this connection. Its ability to easily connect creates a convenience where the inflating process is made easy and fast. Ergonomic Handle: The handle is comfortable and suitable for all users. Easily Read Gauge: The gauge indicates the pressure levels and is calibrated in a way that is easy to understand. Flexible Hose: The hose connects the air compressor and the output. It is long and flexible to enable one move all around to reach all the tires. Stored in the Car: The device is portable and can be stored in the car. This ensures easy retrieval when the need arises. The cost of the air compressor tool and shipping is relatively cheap. Upon purchase, the device comes with an adapter kit that facilitates its connection to an electronic interface. 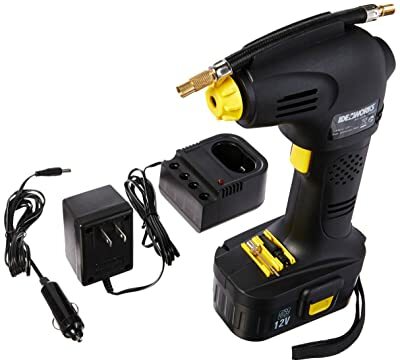 One can easily obtain the 12V power necessary to inflate items such as balls, bicycle tires, pool parts and other equipment around the house. The kit is well packaged and comes with an instruction manual. In the compressor, the under section is created with room to store the hose. Like many products, it comes with a thirty-day refund policy. The policy does not include shipping thus the return of the air compressor means that you incur shipping expenses for the second time. In most cases, the company ships the product without batteries to run the equipment. The request and follow up on the delivery of the batteries included in the cost may turn out to be cumbersome. The company has a poor customer service and the delivery of the batteries may take months. Unfortunately, the air dragon reviews from many users are nothing good to write about. Most clients refer the product as useless as the many specified features do not work well. Also, the said features are not functioning together to accomplish the task set out. For example, the reading gauge is inaccurate adding more pressure to the tire than necessary. Also, the compressor is not able to pump when the battery is recharging. In addition, the tool takes much longer than specified to fill an inflated tire to the specified pressure level. It also tends to overheat when at work. In other cases, the air dragon stopped working completely after one or two usages. The main principle behind the operation of the Air Dragon is the conversion of potential energy into power. The conversion possible through the piston which draws in compressed air into a chamber. The air dragon draws in outside air and channels it through the hose to the section being inflated. The more air pumped, the better as it creates more pressure to boost. The principle is similar to other traditional air compressors. The only difference is that the traditional compressors have a holding tank. The holding tank functions to store the air pumped from outside before it is released. From the experiences of users, it is safe to conclude that the Air Dragon is not the best product out there. There are some other decent tools out there to use to inflate your car tires. The products are more efficient and are manufactured by reputable companies. The three other alternatives available are the Kensun AC/DC, LifeLine AAA and the Electric Air Pump. The Kensum is a speedy performance air compressor that is portable. It adapts to both AC and DC power sources. The digital presets and extra attachment nozzles enables the device to inflate all types of materials and equipment. The pressure gauge is digital with an LCD and unit conversion making it less prone to error when correctly set. The measure of accuracy is 35psi +/-1psi. Also, the air compressor can work continuously at 35 psi for 30 minutes. 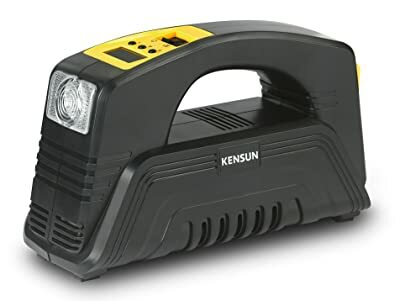 Kensun air compressor is portable and can be stored in the trunk or glove compartment. Another fantastic feature that makes this tool easy to work with is the LED work light that illuminates when operating in the dark. Also, three attachment nozzles for different uses. The product is a result of the collaboration of the LifeLine and AAA companies, leaders in disaster readiness equipment. The LifeLine AAA is constructed with high-quality materials making it durable. The power cord facilitates connection to the outlet. The three nozzle adapters vary in size to enable you to connect to a variety of gadgets. The best feature is the inbuilt pressure gauge to maintain the accuracy of pressure input. The compressor inflates a standard tire in 8 minutes. The only complaint when using the AAA is the noise it produces when working. The electric air pump is a multi use equipment capable of pumping all inflatable objects quickly. It is a handheld tool with intelligent design. The handle is designed in a way to accommodate all persons making it very comfortable to use. It also has an inbuilt pressure gauge for easy reading and monitoring of pressure when pumping. The Air Dragon review brings to light important features of the product. These include the ergonomic handle, compression, the flexible hose and the easy to read gauge. The hand held air compressor is convenient and easy to use. The principle behind the working of the air dragon is that of converting compressed air to power. The product comes with both pros and cons. Many users have not recommended the use of this equipment, and other recommended products include the Kensun AC/DC, LifeLine AAA, and the Electric Air Pump. Their features and functionality are better compared to the Air Dragon. Does not come with clear cut instructions,i/e. how do you preset tire pressure guage for desired pressure? I bought 2 Air Dragons in January, one for each car. I used the one about 10 times and it worked fairly we.. Yesterday to red filler line burst near the unit fitting. I called Telebrands this AM and they apologized but they do NOT sell any spare parts. You have to buy a new unit. Therefore, I would NOT recommend buying this unit. You get what you pay for!